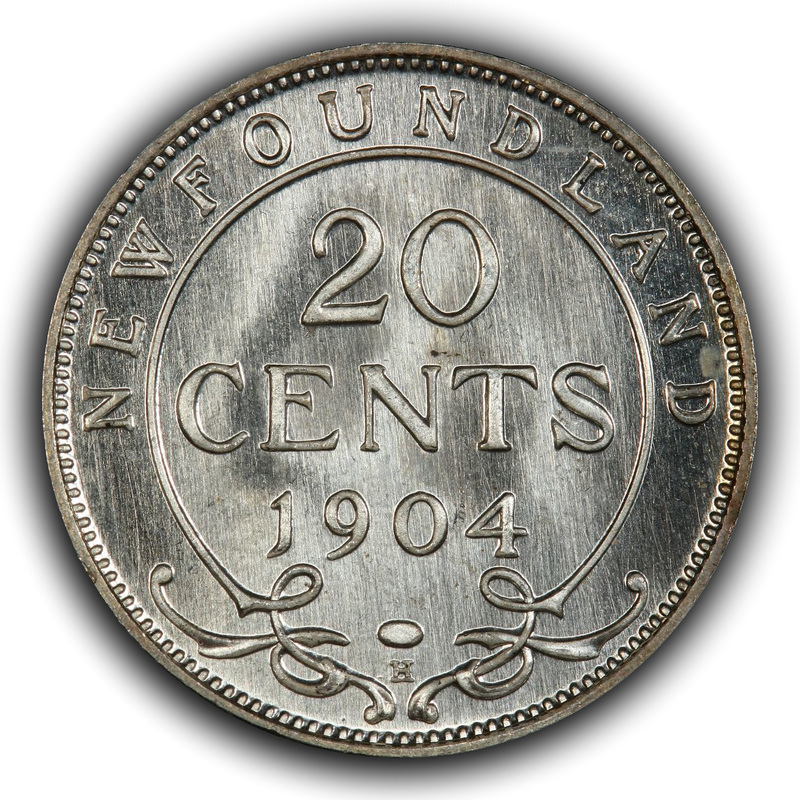 The coin to the left is a specimen strike 1919-C Newfoundland large cent, but the remainder of the coins in this blog article are specimen strike 1904-H Newfoundland twenty-cent pieces. 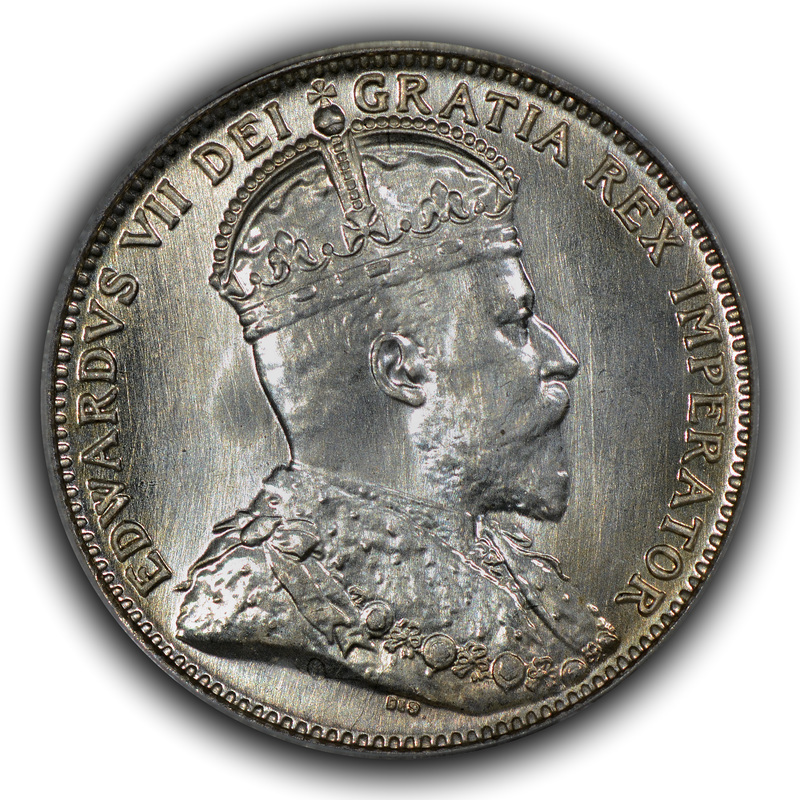 The points brought up with respect to the 1904-H pieces hold valid for the 1919-C piece, too. 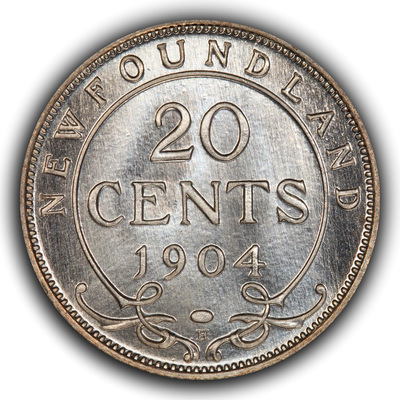 All of the 1904-H Newfoundland twenty-cent pieces that I have seen have extensive die polish on both obverse and reverse and the pattern and placement of the die polish is identical. Also, each coin that I have seen is either essentially completely untoned or covered in a very light champagne patina, which I believe comes from the coins being stored together and toning similarly. Below are three obverse images from three of these coins. The top two coins are SP66 and the images are PCGS True View images that I have reformatted to match the third image. The third image is my coin, which is a SP67 in a PCGS old green holder (OGH). Unfortunately, the OGHs have a tendency to have plastic with inferior optical clarity and oftentimes are a bit scuffed up and show their age. While the slab that my coin is in is quite well preserved, it was nonetheless made with this optically inferior plastic and getting images that show off the die polish can be tricky. 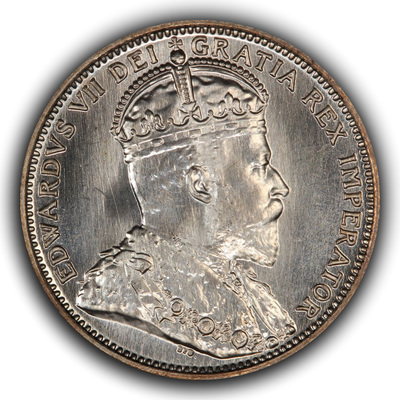 Major groups of die polish can be seen as near vertical lines that appear both in front of and behind the portrait of Edward VII. These lines are largely parallel to one another and within the open field of the obverse, but some of them cross each other's paths. Additionally, the portrait is also smothered in die polish lines. These last two points are important to note as many folks believe die polish lines do not cross one another and that they never appear on the raised devices. These coins clearly show otherwise. The reverse of this issue is also interesting. The quasi-psychedelic, Spirograph-like reverse of William Henry James Blakemore's interpretation of the George William DeSaulles design has a textured, variegated field much like the contemporary, though slightly later, Type I Buffalo nickel of James Earle Fraser. However, the reverse also has die polish in a near-vertical manner with lines that cross one another, although these lines generally to not impinge upon the more delicate lettering and design elements. If tilted somewhat, these die polish lines essentially disappear to reveal the textured feel of the reverse surface. An image that focuses more heavily on the die polish is shown as the first reverse image while the second reverse image highlights the textured field aspect of the coin. 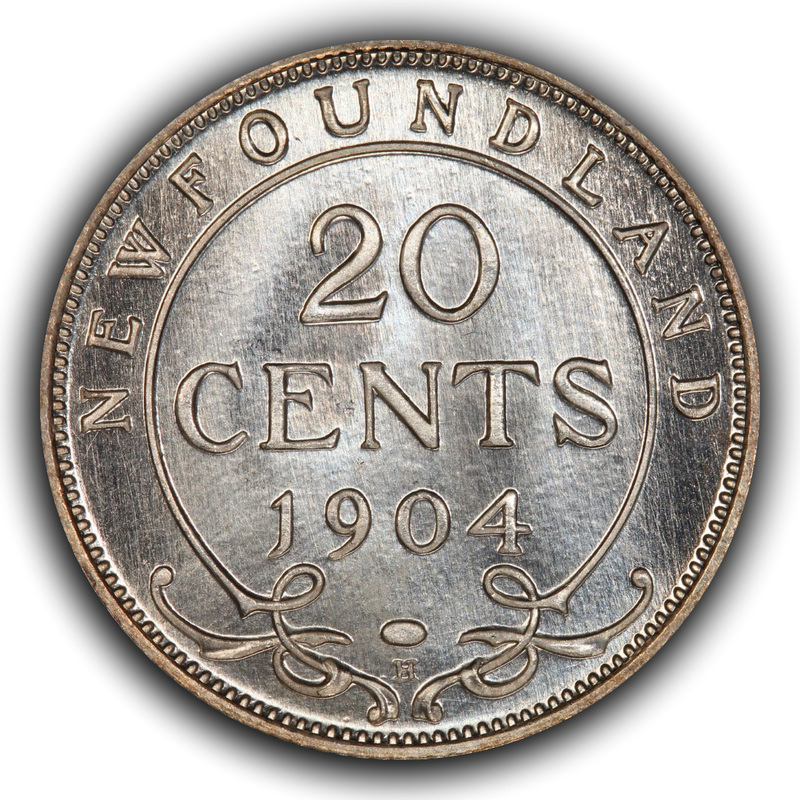 Please note that aside from the obverse images of my 1919-C Newfoundland large cent and 1904-H Newfoundland twenty-cent piece, all images used in this blog article are PCGS True View images of two coins that I do not own. 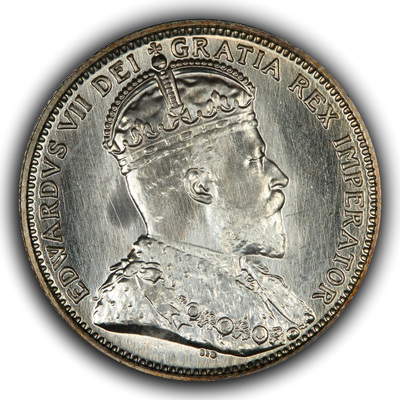 The PCGS True View process allows the imaging of coins prior to encapsulation, which allows greater control of lighting parameters to highlight any aspect of a coin deemed desirable or of interest. 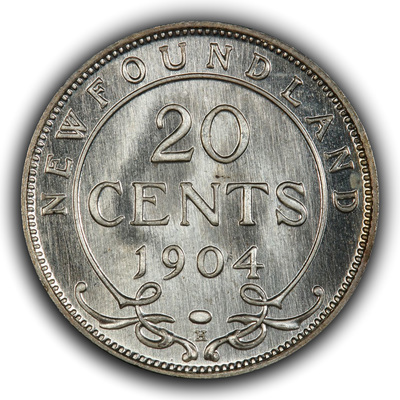 Also note that while I adore Newfoundland coinage, I truly have a soft spot for Newfoundland specimen coinage and believe that these pieces, which were created in astonishingly small numbers, represent what might be termed "sleeping giants" within the great field.